bottle of aroma essential oil with orchid on table, spa concept. Black spa stones and pink cosmos flower isolated on green. Zero waste home, cosmetic nature product. Raw chicken thighs on dark wooden background. Bed linen and towels at the hotel. Clean towel on bed in modern interior bedroom. 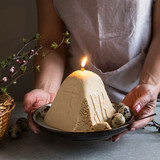 Paskha and kulich, Traditional Orthodox Easter Quark Dessert Curd. Easter background. Traditional cottage cheese cake. Cosmetics for salon aromatherapy, massage or bathroom - bath salt, cream, essential oil, soap, bowls, bottles, jewelry on elegance pink background. Beautiful spa composition with spring cherry blossom flowers and white towel on pink background.